Parents: Oberstabsarzt Curt and Martha (née Kilbach) Macholz. Wife: Married Anny Höcherl on 9 March 1917. 24 February 1909: Entered the Army as a Fahnenjunker in the Deutsch Ordens-Infanterie-Regiment (1. Elsässisches) Nr.152. 1 October 1913: Adjutant of the III. Battalion of Infantry Regiment 152. 14 January 1917: Adjutant of the 102nd Reserve Infantry Brigade. 31 May 1917: Transferred to a General Staff position in the 240th Infantry Division. 9 May 1918: Transferred into the General Staff. 24 May 1918: Transferred to the General Staff of the General Quartermaster. 1 January 1919: Transferred to the General Staff of Army High Command North. 12 June 1919: Transferred to the General Staff of the XVI Army Corps. 1 October 1919: Transferred to the General Staff of Group Command III. 1 February 1921: Transferred to the Reich Defense Ministry. 16 February 1921: Separated from the Army with the rank of Charakter als Major. 1 March 1921: Joined the Landespolizei [Land Police] in Danzig. 25 November 1935: Returned to the Army with the rank of Oberstleutnant and assigned to the staff of Infantry Regiment 67. 1 January 1937: Commander of Infantry Regiment 67 of the 23rd Infantry Division. 26 August 1939: Commander of Infantry Regiment 203 of the 76th Infantry Division. 4 January 1940: Commander of Infantry Replacement Regiment 218. 1 February 1940-5 October 1940: Commander of Division Nr. 192. 5 October 1940-30 September 1942: Commander of the 122nd Infantry Division on the Eastern Front. 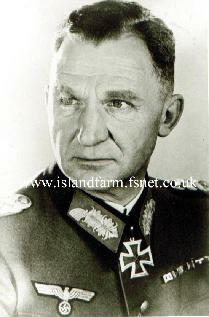 October 1942-November 1942: Commander of the 156th Reserve Division. 1 December 1942: Leader Reserve. 1 March 1943-1 January 1944: Commander of the 191st Reserve Division. 1 February 1944-26 September 1944: Commander of the 49th Infantry Division on the Western Front. 9 May 1945-1 October 1947: Prisoner of war in British and U.S. captivity. Knight’s Cross of the Iron Cross: 16 October 1944, Generalleutnant, Commander of the 49th Infantry Division. German Cross in Gold: 19 December 1941, Generalmajor, Commander of the 122nd Infantry Division.